Summer running can be quite challenging, as there are so many elements that change the running experience. When the humidity level is high, your body struggles to cool itself. Your body attempts to cool down by pumping blood to the external surface of the body, depleting blood levels in the muscles, internal organs, and the brain. Stay hydrated- drink water hours before your run to ensure proper hydration. Did you know that when you start to feel thirsty, it’s more than likely you are in the early stages of dehydration? If you are planning a long run, be sure to know your water stops, and if necessary, place water along your route the night before. Additional options could be in the form of the notorious water bottle belt (grenades) or a hand-held sports water bottle. 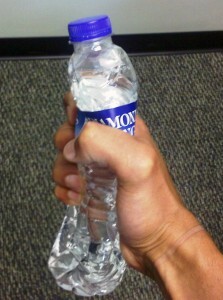 What I like to do is take a half bottle of water, put the cap on snug, squeeze within my hand until most of the air is out, and then cap it. Avoid the sun. Of course, this is tough to do, yet too much sun exposure can lead to skin cancer. Find the shade; schedule your runs before the sun rises or map out a nice shady course. If shade is not an option, always wear sunscreen and protective clothing. Do not let the heat be an excuse to skip a run. Training in extreme elements (once a week) is a great way to gain an edge on your competition. Be safe and get out there.